Never before has the Vatican opened its financial and legal systems to this sort of external, independent review, with the results made public. In centuries past, had secular authorities shown up to conduct such a review, they would have been fought off tooth and nail. For Moneyval, the red carpet was rolled out instead. American lawyer Jeffrey Lena, an advisor to the Vatican on the Moneyval process, told me that evaluators were able to examine records of judicial and diplomatic cooperation, anti-money laundering certifications, accountancy management letters, foundation registry records, and other confidential legal documents. To say that the Vatican traditionally has been reluctant to grant such access is a bit like saying the Tea Party is lukewarm about Obama — in other words, it really doesn’t do justice to the depth of emotion involved..."
Community in Cincinnati and our growing community in Lexington. In 1981 Women Church Convergence held a gathering in Chicago. 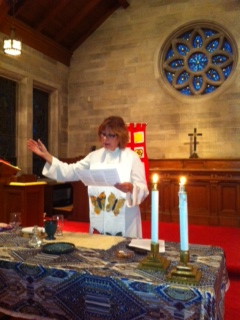 Women of all faiths participated, including some of the Episcopal women priests who were ordained in the late 70s. This is where I met Dominican sister Marge Tuite who became a mentor in my journey to the priesthood. “Make the connections,” she said, “between sexism and racism, sexism and militarism, sexism and nationalism, sexism and capitalism…Today we would include homophobia. The next day as a group we marched outside in solidarity with our sisters and brothers in El Salvador where our government’s support of their armies with our hard-earned taxpayer money caused suffering and death. It was good for my feet to hit the ground, touching the sweet earth of which we are made. I had a hint of the connection Sr. Marge was talking about. "Once a pope trashes you, it's pretty much downhill from there. So once Pope Gregory the Great in 591 declared that the "sinful" woman in Luke's Gospel who anointed Jesus' feet was Mary Magdalene, a whole industry developed to discredit her...There's a zinger for everyone: sisters, nuns, married women, working women. OK, not quite everyone, just the female everyones. You know the litany: the LCWR thing, the birth control thing, the "radical feminist" thing. ..t took almost a century and a half for Pope Paul VI, in 1969, to indirectly disconnect Mary Magdalene from the slur his predecessor levied on her. We are all Magdalenes. How long will it take for the rest of us?" "In a rare display of public concern for the religious freedom of American Roman Catholic women and possibly all Roman Catholic women, an American Jewish rabbi called for change within the Catholic Church. In response to the harsh treatment of our American Roman Catholic nuns, Rabbi Arthur Waskow, Ph.D., founder of the earth-loving, justice- seeking, peace-promoting Shalom Center in Philadelphia, wrote a Shalom Center Report Letter initially intended for his community,criticizing the Roman Catholic leadership for its harsh treatment of our nuns , whom he holds up as champions of social justice..."
Flaccid ‘Fortnight for Freedom’ Fizzles for Fathers, "Exposed "U.S. Bishops as "Inept Campaigners and as Generals Without An Army by Fred Clark/ Some Blame the Nuns! The “Fortnight for Freedom” was a flop. This was supposed to be a game-changer — the U.S. Conference of Catholic Bishops’ big display of political might. But instead it exposed the bishops as inept campaigners and as generals without an army. I thought they’d be better at this sort of thing. They had some formidable assets to work with. For weeks ahead of time, Fortnight events were publicized and promoted in every diocese and every parish across the country. And they had some serious money to work with thanks to deep-pocketed (anonymous) donors. They even got a big boost of support from their allies in the evangelical religious right. This two-week extravaganza was supposed to redefine the political conversation, but instead it went mostly unnoticed and unattended. It was supposed to show massive grassroots support for the bishops’ contention that allowing women to purchase comprehensive health insurance constitutes an intolerable threat to the religious liberty of employers who wish to prohibit that. But instead it showed, definitively, that there is no grassroots support for that strange argument. All that time and money invested and almost nothing to show for it. By the end of the fortnight, the affiliated Republican effort “Conscience Clause” had also collected 6,000 signatures for a petition in support of the bishops — or nearly half the number of signatures collected so far in the “Save Pan Am” campaign to get ABC to revive that failed show. The Fortnight for Freedom was a failure. I suppose, though, that it did succeed in at least one way: providing a handle for plenty of insightful commentary on the bishops’ demands for religious privilege and their increasingly partisan political activism. A sampling of some of that commentary below the jump. In the reaction against Fortnight for Freedom, some are responding to the bishops on their own terms. If the campaign is about religious liberty, they ask, then whose liberty is at stake? The bishops present the Catholic exercise of religious liberty as the ability to reject the use of contraception, or at least the financing of insurance plans that cover contraceptive services. The irony, to those on the other side, is that a campaign meant to promote religious liberty actually denies the religious freedom of many Catholic women, who rely on their personal religious convictions to determine their stance on contraception and the mandate. Studies show that as many as 98 percent of sexually experienced American Catholic women over the age of 18 have used contraception. A recent PRRI/RNS poll reports that a majority of American Catholics do not see the contraception mandate as a threat to religious freedom, indicating that many hold a broader understanding of religious liberty than the bishops maintain. The debate surrounding the mandate, then, is not only about contraception and religious liberty. It is also about who gets to define religious liberty’s very meaning. … Critics of the bishops’ current battle can call on this Catholic history of religious liberty and individual freedom. In their view, women’s choices are an issue of religious liberty — not merely a threat to it. Still, who defines religious liberty remains a matter of authority — and a highly gendered one at that. When the USCCB conveys that the rejection of contraception is the only religiously-motivated choice that warrants the protection of religious liberty among Catholics, they assert the message that only church leaders have the authority to determine what counts as religious behavior. This strips other Catholics of the legitimate authority to negotiate their tradition when determining their own religiously-motivated actions. What is more, so long as the all-male Catholic clergy solely possess the authority to identify what does and does not constitute a free, religiously-motivated choice worthy of legal protection, women have no official authority in Catholic religious liberty conversations whatsoever. As it stands, the religious decisions and actions of all Catholics other than clergy — be they for or against contraception and contraceptive coverage — are seemingly insignificant in “Catholic” concerns about religious liberty. … The bishops, or anyone for that matter, need not theologically condone the contraceptive decisions of Catholic women in order to recognize them as exercises of free, religious choice. Yet the current rhetoric of the USCCB’s “Fortnight for Freedom” campaign does not. … If the bishops continue to exclude so many American Catholics from their representation of religious liberty — notably, the majority of Catholic women — the USCCB fails in its own stated aim to protect the religious liberty of all. In the writings and speeches of Catholic bishops and evangelical leaders in recent months, “religious freedom” has come to mean something close to its opposite. It now stands for “religious privilege.” It is a coded way for them to state their demand that religious institutions should be allowed special powers that exempt them from the laws of the land. … This is a war of conquest, designed to expand the power of religious institutions at the expense of the rest of society and the state. It is about carving out an even larger share of the special privileges and exemptions that are already made available only to organized religious institutions. Such privileges are already substantial. Religions already receive hefty subsidies – by some estimates, as much as $71bn a year – through broad tax exemptions, deductions, and faith-based government programs. A “ministerial exemption” allows them to hire and fire people directly involved in religious activity without regard to anti-discrimination laws. But they want more. And they are willing to turn the meaning of the word “persecution” on its head to get it. The Catholic bishops have been talking a lot recently about the First Amendment. They’ve made the remarkable claim that their tradition is a source of First Amendment freedoms, but their interpretation of such freedom is that it should shield them from prosecution for collaborating in the sexual abuse of children, at the same time that they are doing their best to deny freedom of religion, speech, and assembly to American nuns. Nor do they believe in freedom of conscience for the Catholic Church which is the people of God – a Church that has thoughtfully concluded that contraception is morally acceptable. The recently completed “Nuns on the Bus” tour garnered a great deal of publicity for the sisters involved, who claimed they were making the trip to protest proposed federal budget cuts they say would hurt the poor. However, there were many more undercurrents to the nine-state, two-week trip than most people realize. The giant banner on their bus proclaimed, “Sisters driving for faith, family and fairness,” and a gushing media noted that the sisters’ fans along the way greeted them like rock stars. However, it turns out that the sisters who organized the June 18-July 2 tour — from the sisters’ lobbying group Network — also were driving for their own agenda. The Nuns on the Bus tour did treat issues of poverty, but the tour also was designed to highlight the good works many sisters do in order to respond to the doctrinal assessment by the Vatican Congregation for the Doctrine of the Faith (CDF) that found numerous doctrinal errors in the Leadership Conference of Women Religious (LCWR). The LCWR is a superiors’ organization of about 1,500 sisters who lead orders that include 80% of the sisters in the country. The LCWR has had ongoing difficulties with the Vatican for decades, culminating in the April 18 assessment report that directed Archbishop J. Peter Sartain of Seattle to oversee a reform of the organization. Network also was named in the assessment, for it is closely connected to LCWR. Likewise, it was no accident that the sisters’ two-week bus tour was timed to coincide with the U.S. bishops’ June 21-July 4 Fortnight for Freedom. The fortnight observance called for prayer, fasting, education and action to preserve religious liberty in the face of the U.S. Department of Health and Human Services (HHS) mandate that all employers must provide insurance coverage for sterilizations and drugs that are abortifacient and contraceptive. The only religious exemption is for churches and does not include Catholic hospitals, schools and other institutions that serve the general public. The bus the sisters chartered for their trip also made for sensational photos, with its billboard-sized “Nuns on the Bus” signs, but the image did not match the reality; for rather than a busload of sisters, only two sisters made the entire trip. They were joined along the way for a day or two by a few local sisters, but never were there more than six sisters on the bus, which is usually rented by entertainers on the road and equipped for comfort, with a lounge area and a kitchen. How did a handful of sisters on a bus get such wide media coverage? The answer might be found in the media professional who accompanied them on the bus and her employer. A perceptive blogger, Elizabeth at Laetificat, made the connection that the sisters’ media representative, Casey Shoenberger, is employed as a media relations assistant for the organization Faith in Public Life (FPL) and had worked in the associate program at Network. According to a June 27 media advisory from the U.S. Conference of Catholic Bishops (USCCB), FPL was founded with help from the pro-abortion group Center for American Progress (CAP) that is directed by John Podesta, former chief of staff for President Bill Clinton. The USCCB advisory said that both FPL and CAP have received funding from billionaire atheist George Soros. The unusual USCCB advisory was issued because the bishops became aware of a memo to news media from FPL’s John Gehring “casting aspersions on the Catholic bishops and their educational project on religious liberty, the Fortnight for Freedom.” Gehring is Catholic outreach coordinator for FPL, according to its website. The bishops’ conference advisory said: “In his memo, Mr. Gehring juxtaposes what he calls the bishops’ ‘fictions’ with his ‘facts’ — and he provides the media with ‘questions to ask Catholic bishops’ that he apparently thinks are embarrassing.” The USCCB advisory then went on to answer all the questions and show how fact and fiction are confused by Gehring himself. Additionally, the FPL website reveals that the connection between FPL and the Network sisters goes back at least two years. On the FPL “Successes” page is an entry about the March 17, 2010, letter on Network stationery to Congress urging passage of the Patient Protection and Affordable Care Act, commonly known as Obamacare. The bishops, while supporting health-care reform, did not support that bill because it included funding for abortion and did not have adequate conscience protection. The Network letter claimed to represent all 59,000 sisters in the U.S., but was signed by only about 60 sisters. The bishops’ conference issued a clarification about that letter the next day, explaining that the signers had “grossly overstated whom they represent” in that letter. “Network’s letter about health-care reform was signed by a few dozen people, and despite what Network said, they do not come anywhere near representing 59,000 American sisters,” the clarification stated. Nevertheless, the FPL website reports that in the final days of the health-care debate in 2010, FPL “worked with 60 women religious, representing nearly 59,000 nuns, who sent a letter to Congress supporting health reform and challenging misinformation about abortion provisions. With the U.S. Conference of Catholic Bishops opposing the bill, the nuns’ letter assured undecided pro-life Catholic members of Congress that supporting the legislation was in keeping with Catholic teaching, a crucial success that helped ensure passage of health reform.” FPL goes on to take credit for making sure the Network letter reached the media. Network’s communications coordinator, Stephanie Niedringhaus, told the Register that FPL’s Schoenberger accompanied the bus tour only because she herself was unable to go due to family obligations. She said she was not aware of any funding for the tour from Faith in Public Life and said that the funding came from “a long list” of sources, with that funding still coming in. Whatever the case, Catholic sisters who disagree with the position of the bishops make very helpful allies for anyone with a political agenda who is working to discredit the bishops’ strong stand on religious liberty. Strangely, those “friend raisers” were “open to the public, closed to the press,” according to the Nuns on the Bus website. However, writers for the National Catholic Reporter and Commonweal were admitted to the South Bend event and reported on it for their publications. Visits to the offices of local congressmen along the bus route also were tightly controlled. While those visits were listed as “open to all” on the Nuns on the Bus website, in South Bend the people who turned out to greet the bus were not allowed to accompany the sisters into the office. This writer was told by Casey Shoenberger that the sisters would report to us what transpired when they came out. According to the Dispatch: “Tiberi spokeswoman Breann Gonzalez said the congressman’s staff has a different view of the conversation but was receptive to the nuns’ concerns and did discuss the need for programs to help the most vulnerable. So, while the Nuns on the Bus tour did highlight some of the wonderful work sisters are doing for disadvantaged people, it also played a partisan political role and enabled Sister Simone Campbell and her sympathizers to display their disregard for the teaching authority of the U.S. bishops and the Vatican. Sisters in Crisis: The Tragic Unraveling of Women’s Religious Communities. by Rabbi SUSAN TALVE, founding Rabbi of Central Reform Congregation of St. Louis. Her story, below, both moves the heart and enriches the mind. It is a tale of how the disempowered – in this case, women – can reclaim their power. When the line between the personal and the political dissolves, it is usually due to religion. In the summer of 2007, two women came to our synagogue to tour the sanctuary. 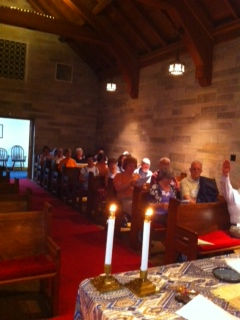 Someone had told them that the sanctuary is a welcoming space used for many different interfaith activities. Indeed, a fundamental value of CRC is that our sanctuary provides a safe space for change, that we always practice radical hospitality. Afterwards, the women came to me in my office and said, "We would love to have our ordination here." When we began our congregation 28 years ago, it was with a core value never to own a building. This was so that we would never have to put more resources into bricks than people. We also have a strong commitment to serving the city of St Louis where there seemed to be plenty of buildings that we could recycle and reuse. But our growth rate made it challenging to stay in the church that originally housed us, and our commitment to being '"green" made it difficult to move into an older, inefficient building. So, we built a building after all, promising that we would practice radical hospitality and that it would be a disabled-accessible resource for the entire community. The request from these women to house their ordination offered us another way of fulfilling our promise. But this act of “radical hospitality” was radical indeed. For the women who sought to use our sanctuary for their ordination were Roman Catholics, and they planned to be ordained as Roman Catholic priests. The risk involved in ordaining these two women was that they – and therefore we – were challenging the Roman Catholic hierarchy in St Louis. Our synagogue is the only one in the "parish" of the Archdiocese. Our city’s namesake is Louis IX, sainted for his role in the Crusades and for burning thousands of Talmudic commentaries and other valuable Jewish books in 1242. But in this generation, we and the Archdiocese have often stood together -- for immigration reform, for access to health care, and for other causes that champion the rights of the most vulnerable. I had also been invited to be in the front rows at the Cathedral when the former Pope John Paul visited. The board of our congregation decided that we should host the ordination in spite of the tremendous controversy it might bring. We then received pressure from the Jewish and Catholic leadership to revoke our invitation. Leaders in both the Jewish and Catholic communities warned that we were setting back Catholic-Jewish relations two hundred years. I personally received death threats from anonymous sources. The day of the ordination, the Archbishop at the time sent a videographer to the service who secretly taped the crowd. Many of the Catholic leaders who dared to come that day lost their jobs. Some were even excommunicated, a terrible threat to those who believe in the essential nature of the sacraments to one's life. But many others celebrated us as heroes. Alongside the threats, I received potted plants from grateful orders of religious women. Not only criticism but also accolades poured in from all over the world. The board made our decision based on our core value of practicing radical hospitality. I shared this guiding principle but for me it was also an issue of women's rights. As one of the first women ordained as a Rabbi in this country, I felt a connection to all women who are called to serve in the spiritual realm in whatever religious tradition they follow. When I heard many others ask why these women had to be Roman Catholic priests, why not Episcopalian or even New Catholic, I recognized a familiar challenge. How many times had I heard a similar critique from feminist friends who wondered how I could be true to my core values serving in a Patriarchal context! Wouldn't a Wiccan or more woman-friendly spiritual path better suit me? I answer that I am Jewish and I am a feminist. Both realities define me. I felt the same was true for these women. Their hearts were in the Church and their desire was to serve within the sanctity of their faith and their church. I especially felt this from the Bishop who came to ordain them. She served as a Dominican Sister in South Africa for 45 years. She received her training in Rome and taught seminarians homiletics though she was not permitted to preach in a church. Still, she served until she was convinced by male Bishops to let them ordain her and bestow upon her the apostolic succession that allowed them to ordain priests. The Bishops had to keep their identities secret or risk excommunication. She accepted their challenge and lost everything. After a lifetime with her Order, she was expelled, excommunicated and had nothing: no health insurance, no pension, no home. But she had a calling toordain qualified women who served Roman Catholic communities all over the world. One of the more hurtful critiques of our hosting the ordination came from a priest I had been friends with and worked alongside for many years. Essentially, he told me to stay out of the Church's business. He added that he could not trust me and would no longer work with me. I was crushed and outraged. Where was his compassion for his sisters? Where was his willingness to take a stand for the women he served and the ones he served alongside? When I took a step back, I realized that I was getting a glimpse of what happens when any group’s position of power and privilege is challenged. I wish I could say that my relationship with the Catholic Church of St. Louis is on the mend, that we are making our way back to once again standing together and fighting for the rights of the disenfranchised. But as a Rabbi and a woman, I cannot, in good faith, say that. The heart of my most recent storm with the Catholic Church can be traced to reproductive freedom and women's health, in the debate on access to birth control which has played out at both the national and state levels. This year, the Missouri legislature passed Senate Bill 749, which gives employers the right to refuse to provide health insurance coverage for contraception based on “religious beliefs or moral convictions.” While the bill may have been especially intended to allow the Catholic Church to deny contraceptive coverage to employees of Catholic-related hospitals and universities (which employ non-Catholics and often receive governmental funds), it is written even more broadly so that any employer can deny its employees access to birth control by citing the employer’s moral objections. There is no way to separate women's health from reproductive freedom, so it seems that the Roman Catholic hierarchy is willing to sacrifice the health and well being of women to keep their position of privilege. The most recent attack on Catholic Women Religious is also connected to the Sisters’ moral leadership in the arena of health care access and affordability, especially for poor women. The Sisters under attack have been willing to defend the health care rights of poor women even if it means that they have to stand up to the Church and risk everything. In last week’s Torah portion, the daughters of Zelophechad stand up to Moses and speak up when they are skipped over for their inheritance even though their father had no sons. (Num. 27) Seeds for change were sown that day that would eventually bring more equal, just and compassionate inheritance laws for women. I believe that Arthur Waskow is right to stand with the Sisters. I will stand with him, with scars from previous attacks, to support and protect the religious freedom of American women and families from those who would threaten our very lives. The time leading up to the ordination was the most painful clash of the personal and the political realms of my work to date. 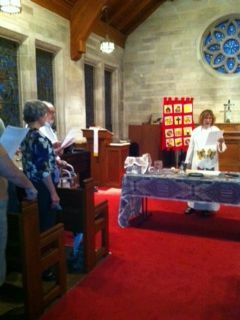 The ordination itself, however, proved to be one of the holiest days in our sanctuary, our Sukkat Shalom, our Shelter of Peace. Taking a stand always has consequences, and true change takes time. But raising our voices together as the daughters of Zelophechad did is sure to make a little more room for the religious freedom of us all. "In April, the Vatican announced that three American bishops (one archbishop and two bishops) would be sent to completely reorganize the Leadership Conference of Women Religious, a member organization founded in 1956 that represents 80 percent of Catholic sisters in the United States. In its assessment of the group, the Vatican's Congregation for the Doctrine of the Faith said the leadership conference is undermining Roman Catholic teachings on homosexuality and birth control and promoting "radical feminist themes incompatible with the Catholic faith." It also reprimanded the nuns for hosting speakers who "often contradict or ignore" church teachings and for making public statements that "disagree with or challenge the bishops, who are the church's authentic teachers of faith and morals." "In their own statement, the nuns said the Vatican's doctrinal assessment of the group was based on "unsubstantiated accusations" and may "compromise" the ability of female nuns to "fulfill their mission." "We have been, in good faith, raising concerns about some of the church's teachings on sexuality. The problem being that the teaching and interpretation of the faith can't remain static and really needs to be reformulated, rethought in light of the world we live in. And new questions and new realities [need to be addressed] as they arise. And if those issues become points of conflict, it's because Women Religious stand in very close proximity to people at the margins, to people with very painful, difficult situations in their lives. That is our gift to the church. Our gift to the church is to be with those who have been made poorer, with those on the margins. Questions there are much less black and white because human realities are much less black and white. That's where we spend our days." "A bishop, for instance, can't be on the street working with the homeless. He has other tasks. But we can be. So if there is a climate of open and trusting and adequate dialogue among us, we can bring together some of those conversations, and that's what I hope we can help develop in a deeper way." "The position we took in favor of women's ordination in 1977 was before there was a Vatican letter saying that there is a definitive church position against the ordination of women. So it's interesting to me that the document [just released by the church] goes back 30 years to talk about our position on the ordination of women. There has, in fact, been an official opinion from the church that that topic should not be discussed. When that declaration came out, the response of the Leadership Conference of Women Religious was to call for a nationwide time of prayer and fasting for all Women Religious in response to that. Because our deep desire for places of leadership of women in the church be open. It remains a desire. Since then, the Leadership Conference has not spoken publicly about the ordination of women. Imposing a silence doesn't necessarily change people's thinking, but we are in a position to continue to be very concerned that the position of women in the church be recognized." On the phrase "radical feminist themes"
"Sincerely, what I hear in the phrasing ... is fear — a fear of women's positions in the church. Now, that's just my interpretation. I have no idea what was in the mind of the congregation, of the doctrine of the faith, when they wrote that. But women theologians around the world have been seriously looking at the question of: How have the church's interpretations of how we talk about God, interpret Scripture, organize life in the church — how have they been tainted by a culture that minimizes the value and the place of women?" Our gift to the church is to be with those who have been made poorer, with those on the margins. Questions there are much less black and white because human realities are much less black and white. That's where we spend our days. "I think the criticism of what we're not talking about seems to me to be unfair. Because [Women] Religious have clearly given our lives to supporting life, to supporting the dignity of human persons. Our works are very much pro-life. We would question, however, any policy that is more pro-fetus than actually pro-life. If the rights of the unborn trump all of the rights of all of those who are already born, that is a distortion, too — if there's such an emphasis on that. However, we have sisters who work in right-to-life issues. We also have many, many ministries that support life. We dedicate to our lives to those on the margins of society, many of whom are considered throwaway people: the impaired, the chronically mentally ill, the elderly, the incarcerated, to the people on death row. We have strongly spoken out against the death penalty, against war, hunger. All of those are right-to-life issues. There's so much being said about abortion that is often phrased in such extreme and such polarizing terms that to choose not to enter into a debate that is so widely covered by other sectors of the Catholic Church — and we have been giving voice to other issues that are less covered but are equally as important. "Our concern is that right-to-life issues be seen across a whole spectrum and are not narrowly defined. ... To single out one right-to-life issue and to say that that's the only issue that defines Catholic identity, I think, is really a distortion." VATICAN ROMP ROCKS RATINGS / Nun-Justice Triumphs! Those whom the Pope bashes. Than the words you must say. Then I won't feel so bad! Then I won't feel so ba-a-a-ad!" Let us unite in solidarity with the LCWR for nunjustice! Will the LCWR go along with the hostile Vatican take-over, declare independence, or do something else? You can support our Catholic Sisters as their leaders meet during this historic moment in our church's history. See how you can help in the article below! holding their important annual conference in downtown St. Louis at The Millennium Hotel. recognizes this matter has deeply touched Catholics and non-Catholics throughout the world. clearly shared by many people around the world. for their works of charity and witness. Make sure to bring plenty of water! others to do so. Forward this e-mail to any interested. Catholic Action Network, 438 N Skinker, St.Louis, MO 63130.
mommamar36@juno.com or Kathleen Barnes Barneskathleen@att.net. Make a donation for the welcome bouquet. 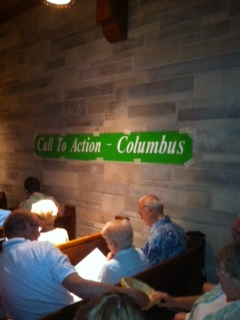 Catholic Action Network 438 N Skinker, St. Louis, MO 63130. Catholic Action Network is a 501(c)3 organization. Welcome the sisters in person. Tuesday, August 7, 2012 at the St. Louis Airport and on the sidewalk at the Millennium. CAN will be selling t-shirts with our logo for St.Louis: A "Sister" City for $20 a piece. Stay tuned for information about how to order and when/where to pick them up. "Pink Smoke Over the Vatican" tells the story of the struggle for women to be ordained in the Roman Catholic Church. Through interviews and historical vignettes, it portrays the tragedy of deeply gifted women, called by the spirit, but rejected by their own leaders. In watching the movie, it was tempting at times to distance myself from the Roman Catholic Church. After all, I'm Anabaptist, and we don't believe in the church hierarchy or that priests are a necessary bridge to reach God. But I realized that the story of the men in this documentary is my story as a Christian man. The most moving scene in the film is the ordination of women as priests by a woman bishop. The scene brought unexpected tears to my eyes. My mother experienced deep pain from the Mennonite church where I grew up. Her call to leadership as Sunday school superintendent led to some members leaving the church, and she felt abandoned by male leaders. The story of these women joyfully entering the priesthood is my mother's story and it is my story. In many ways the documentary is the story of the women at that ordination service and the aftermath: their excommunication. This is also my story as a man in the church. Unless I am an ally to women struggling for a voice, I am no different from the hierarchy who excommunicates them. I grew up swimming in affirmation of my gifts in leadership while my Mennonite female peers had to fight for recognition. Many gave up and embraced their role as "helpmate," settling for being "separate but equal" in the body of Christ. Those that didn't still bear the scars. Identifying with the narrative of this movie also means that I can claim as a role model Father Roy Bourgeois, now at the edge of excommunication for speaking out publicly in support of ordination of women. Throughout the documentary, he speaks powerfully about his call to speak out, not just for women priests in the abstract, but alongside specific women who he has seen called to the priesthood. He names their specific gifts in the struggle for peace and justice. My calling as a faith-based peace and justice activist came at the gates of the School of the Americas (SOA) in Fort Benning, Ga., during a Eucharist led by Father Roy and others of SOA Watch. It would have been very easy for Father Roy to say the SOA is my struggle, not women. To say: I can't risk my role as a priest. And in in fact, Father Roy's stand has cost SOA Watch the institutional support of many Jesuit institutions who previously supported them financially and sent busloads of students to the annual vigil. In my journey since my Eucharist at the gates of the SOA, I have been privileged to walk with many Catholics struggling for justice in their church and outside it. Pink Smoke makes it abundantly clear that the struggle for women's ordination is not in isolation from the struggle against racism and militarism. Patricia Fresen, a nun stripped of her order for her ordination as a priest, took a courageous stand against apartheid before its fall in South Africa. The one missing piece in this narrative is the struggle for LGBTQ people in the catholic church, which is not mentioned. Organizations like Dignity USA have been working for ordination of LGBTQ people since 1969 here in the United States, including women. Unfortunately, no one identified with that movement was interviewed or mentioned in the film. It is clear that the faith of these women is not only personal, but also communal. Fresen, a theologian, shares about her call to ordination as a bishop after she had already been ordained as a priest. The man who ordained her knew that he didn't have much time left as a Roman Catholic priest. Fresen said that she wasn't sure she felt ready, but the pro-ordination bishop told her that her ordination as a bishop wasn't about her, but about the community calling her. The recurring theme of community and equality deeply resonated with me as an Anabaptist. Interspersed with these women's stories is an interview with Rev. Ronald Lengwin, spokesperson for the diocese of Pittsburgh, who spoke for the church's official position of sexist exclusion. After each of his arguments against women priests is made, there is a careful and thoughtful response from the other interviewees which laid bare the stark sexism at the root of Lengwin's statements. At the end of the movie, Lengwin's final argument seems to be that, for the "unity of the church," these women (and the men who ordain them) should simply go elsewhere, essentially giving up on the universal claims of the Roman Catholic Church. But those working for women's ordination are having none of it. The women who have been thrown out of the church powerfully claim their Catholic faith and identity despite their excommunication. It is their home, and they will continue their struggle to make it their space again."